Some of you may remember my first rendering of Magic Bullet, I made a new one with a different point of view, much more close up. The previous one was made with yafray, this one has been rendered with Yaf(a)ray. Nice! Almost photo realistic. keep it up! Great work right down to the edges of the box. I think you have used just the right amount of blur also. I love your renders. All of them ! wow great! dof is coming too strong on the right side IMO but otherwise it is very realistic. Ah, yeah…I remember. I like this one even more than the old one, to be honest. Quite realistic, only the bullet itself seems a litte off - maybe too reflective. 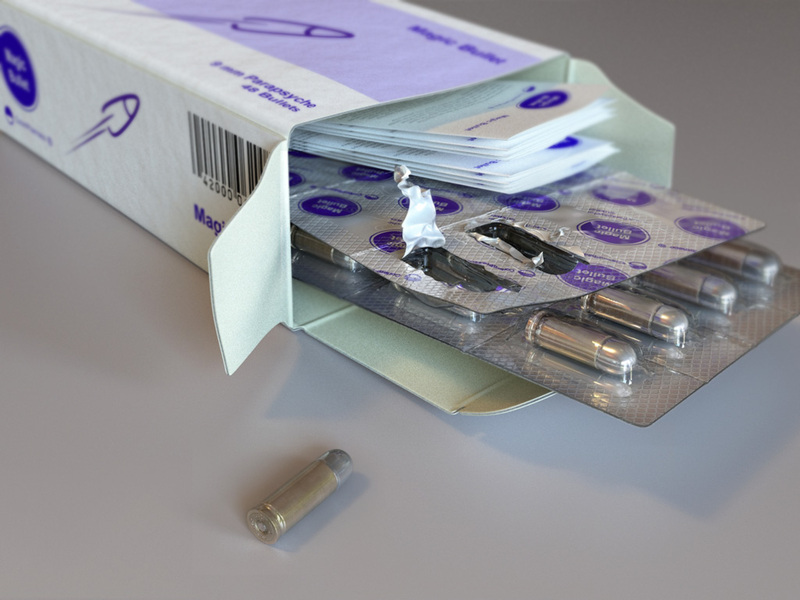 Nevertheless, wonderful job on the package and the plastic thing holding the bullets. I’m just curious but why did it need so long to render? Did you use extremely high quality settings (I’m not that familiar with yafaray yet)? Or is it only your computer? Amazing image, how many poligons do you have in this scene? The modeling details are incredibles. I used a core 2 duo at 3.2Gh for the rendering. The huge time is due to the fact that the image has been calculated at 1600x1200 with high settings, anyway pathtracing in Yafaray is a very long process as it uses all the objects in the scene to participate in light calculation. Direct lighting is less havy but produces a much more flat result. Absolutely perfect! It’s photo realistic and the level of detail is incredible! Awesome work yet again enricoceric! Where can you buy these pills? Dude, that is awsome! I seriously can’t tell that it isn’t real. Any chances of giving out the .blend file? Amazing! It’s the greatest work I’v ever seen. As everyone said, it’s a photo. The materials are totally quite nice and I didn’t know we could make such a realistic render with Blender and Yaf(a)ray. You are really talented to make the settings for materials, lighting and everything. I really want to know what kind of HDR image you used for this and how you make the setups. If this ain’t make it to the Official Blender Gallery then I’m going to shoot Ton (nah also not really).